During my strawberry cake recipe experiments, I tested out a strawberry cake from scratch recipe using freeze dried strawberries. I honestly did not think this cake would turn out at all but I was surprised by the texture and the flavor that came through. The thing I liked most about this cake is that it cuts really cleanly making for some nice slices so I have decided to also include this recipe in my “successful strawberry cake recipes” list because it’s a really great option for professional cake decorators who don’t want to use fresh strawberries but still want all the flavor. This strawberry cake from scratch had a totally different type of flavor than the cake made with fresh strawberries. More tart, like a ZING to it. The crumb is very fine and there are no visible pieces of fruit in the batter. Not necessarily a good thing or bad thing but makes for some very nice cake slices. The other thing I noticed is the color was a little bit lighter pink. This is probably due to the fact that when you bake fresh strawberries, the flesh tends to turn brown. Even when you’re using a strawberry reduction. The lemon juice helps a little with the browning problem but doesn’t get rid of it completely. I think the process of freezing those little berries actually helps preserve the color as well. 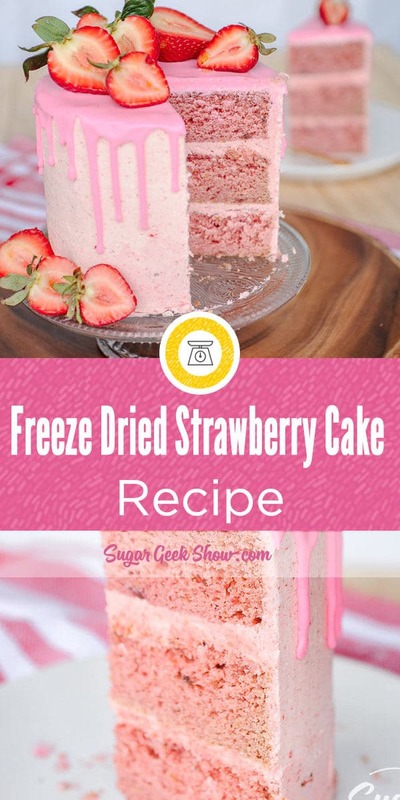 How does freeze dried strawberry cake taste? 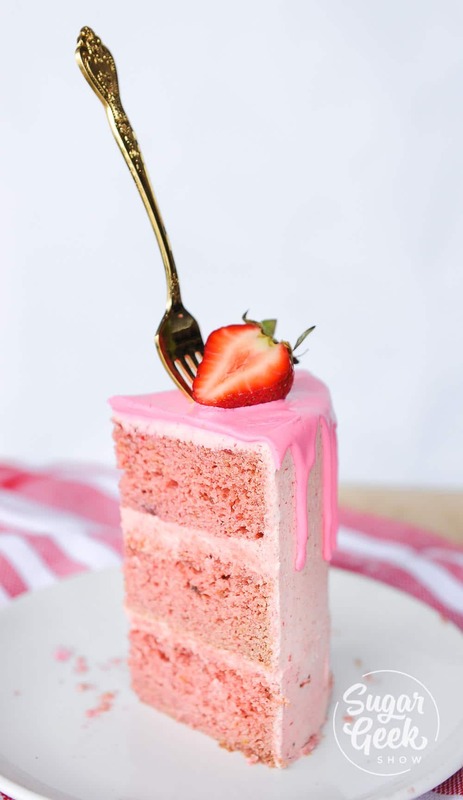 The strawberry cake recipe from scratch has a crumb that is very tender and soft although not quite as moist as the fresh strawberry cake recipe which made it a winner in my book. But as far as easy goes, this one is a snap. Just grind down your strawberries into flavor dust and add in with the dry ingredients. 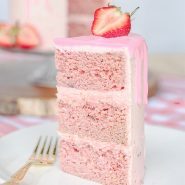 I paired my strawberry cake with strawberry buttercream but used more ground up freeze-dried strawberries in place of the puree. The nice thing about that is that again, there are no fresh fruit lumps in the frosting so you’re able to get a very smooth outer layer of frosting. I topped this cake with water ganache colored with pink food coloring from Artisan Accents which actually works really great for coloring SMBC and chocolate because both are oil based! Which is best? Freeze-dried or fresh strawberries? So whatever tastes best to you is what you should go with. Not everyone can get freeze dried strawberries in their area so that might not be so great of an option if that is the case. The other thing is they are a little expensive. Mine cost about $4 from target for 1oz which was enough to make one strawberry cake but if you where making more, the cost might be too much. Make sure you factor that in when you’re pricing your cakes out for your clients. 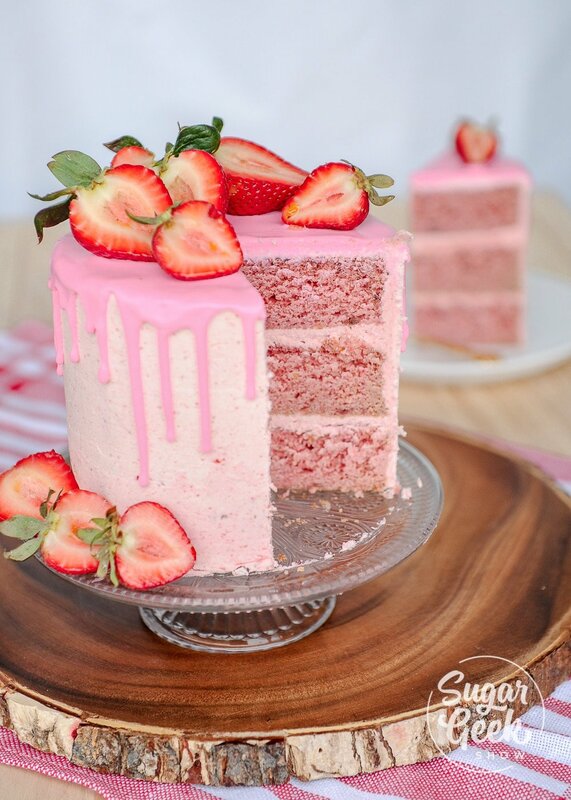 Overall I think this is a great option for strawberry cake and worth a try! Place freeze dried strawberries in a spice grinder or food processor and pulse until they become a fine powder. It may be necessary to sift the strawberry powder to ensure that there are no large pieces remaining. Whisk the flour, sifted strawberry powder, baking powder, baking soda, salt, and lemon zest in a medium bowl. Combine the milk, oil, vanilla extract, strawberry extract and food coloring in a separate medium bowl. It can be decorated with fondant or fondant details or just buttercream? What are the best freeze dried fruit brands that you recommend? I’m interested in experimenting with mango and banana. I found that cake flour was too delicate 🙂 let me know how your experiment turns out! Genius to use the freeze dried. 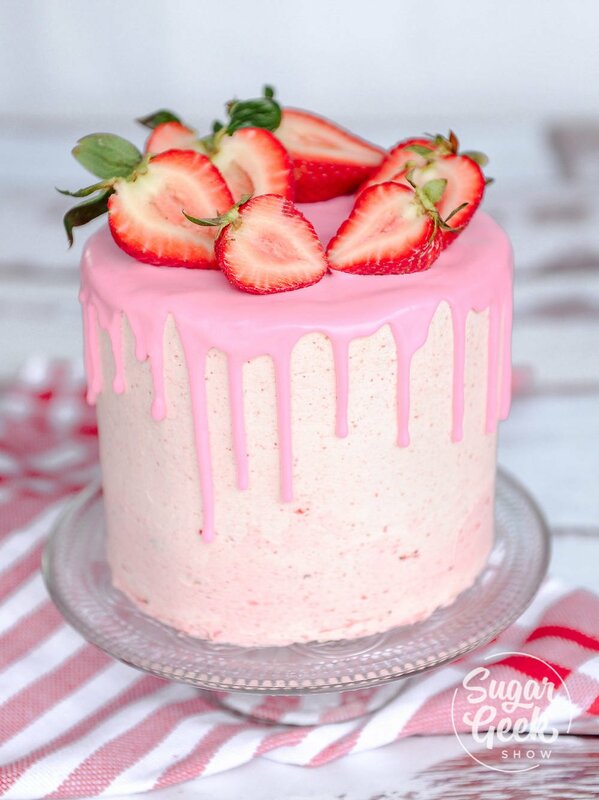 Perfect Strawberry cake has eluded me in the past but I tried this and the results are amazing.